Today is National Pickle Day, and since I am a Bacon person, a Pickle person, and A Cheese person, I decided this was a perfect snack! Bacon wrapped pickles!!! .. and some with cream cheese! D.E.licious! I bought whole kosher dill pickles. No, I don't know if Kosher tastes better than regular. And yes, I stood at the store for a while trying to decide which one to buy. I ended up with Kosher because I remember having that in the house when I was little. Since there was no solid basis for my purchase, I'm sure you could go ahead and buy whatever dill pickles you want. I figure buying the whole ones, instead of spears, is ultimately what helped my pickle stay crunchy. Fresher, maybe? Bacon, I bought double smoked bacon. Why? Because it was in stock and on sale. I considered the apple smoked bacon because it might have added a fun flavor but decided to leave that purchases for other fun uses. In a previous experience, it was decided that thick sliced bacon doesn't wrap the best. At least not around smaller items. Everyone loves cheese! .. You ever have those pickles wrapped in cream cheese and ham? Usually people take a slice of ham (prosciutto and corned beef have been used too), spread it with cream cheese, and wrap it around a pickle spear. People usually start picking at it before you can even get them all sliced! 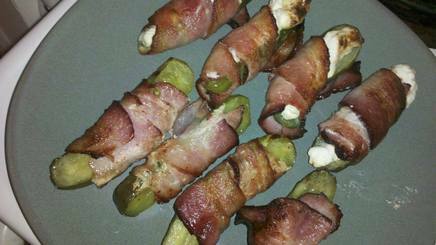 Point being, I thought of that and decided cream cheese would be a lovely addition to these bacon wrapped pickles. Just use a knife to cut a little bit of the center out. (I tried to use a spoon at first. Unsuccessful. Pickles aren't as soft as I would've thought.) Stuff that pickle with cream cheese and you're good to go! I tried making things on a cookie sheet once and the bacon grease prevented it from getting crispy so anything with a drip pan that can withstand the heat of the broiler will work great! Broiler pans are made for that but I can't seem to find mine so I use a roaster pan that has a rack .. drip tray .. wire looking thing. I don't know the technicalities of what it's called. Just use something so your food isn't cooking in it's grease :) Place it on the top rack of the oven. Set to Broil. And try not to burn your face as it's pressed it up against the oven window waiting for the awesomeness to cook! Those are all my tips and tricks to the wonderful, bacony, deliciousness of bacon wrapped pickles! The pickles stayed crunchy and kept their zingy pickle flavor. The cream cheese added goodness .. and I think it soaks up some bacon grease which, of course, adds it's own deliciousness! Now go out and enjoy some bacon wrapped goodness!